NAF Five Star Magic Calmer contains Magnesium, as well as the herbal calming agents St John's Wort & Hops, to help with your horse's confidence & ability to concentrate on the work asked of him/her. It comes in a powder or liquid form. Feeding Instructions- Give a higher loading rate initially, then lower to a maintenance rate. The maintenance rate can be adjusted to suit your individual horse & isn't necessarily related to bodyweight. NAF Instant Magic Syringes are ideal to give just before a potentially stressful event, such as competing; travelling; clipping or a visit from the vet, farrier or dentist. They are fast-acting, giving a calming effect with 1-1.5 hours. NAF Instant Magic Syringes contain bio-available magnesium as well as the herbal calming agents St John's Wort & Hops. Feeding Instructions: Give one whole syringe 1-1.5 hours prior to when calming effect is needed. If necessary, give one syringe the evening before too. 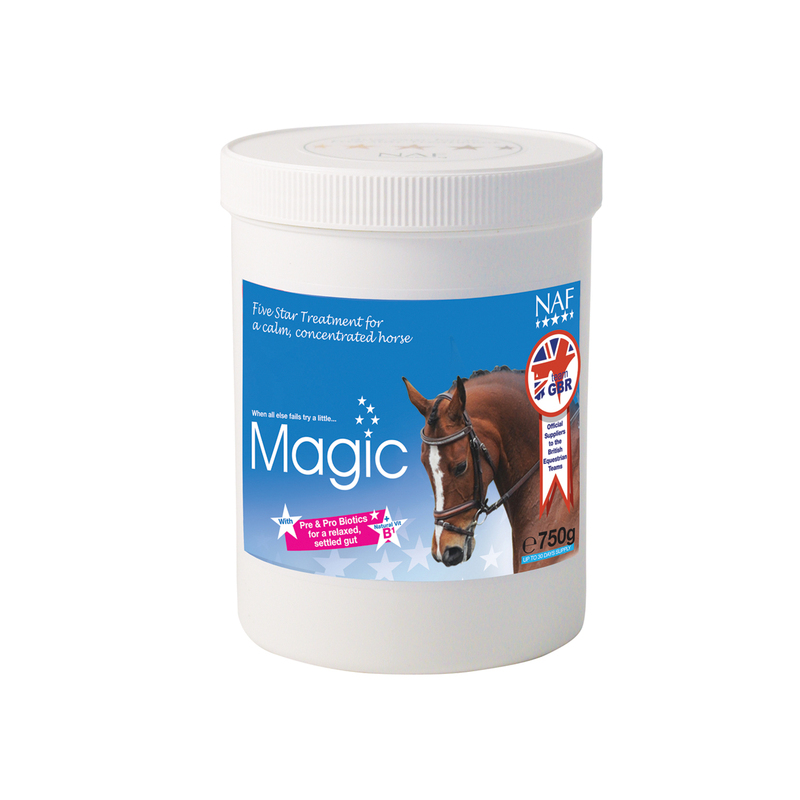 Please note the 15kg tub of NAF Five Star Magic is a 'Special' item from our suppliers. Therefore, we cannot offer a refund on this product for returns or order cancellations.